Sorry about the lightweight updates lately. I’ve had a busy week at work and just came back from an overnight business trip a couple of hours ago (yes, on a Saturday!). So to keep you occupied until I can post something a little more profound and insightful, here’s a look at what could have been a very embarrassing way to go. We’ve already seen him nearly squeezed to death in a rolled-up gym mat, but I wonder if death by a paper plane (even in Bullseye’s capable hands) might not have been worse. Either way, the panels below are quite funny. 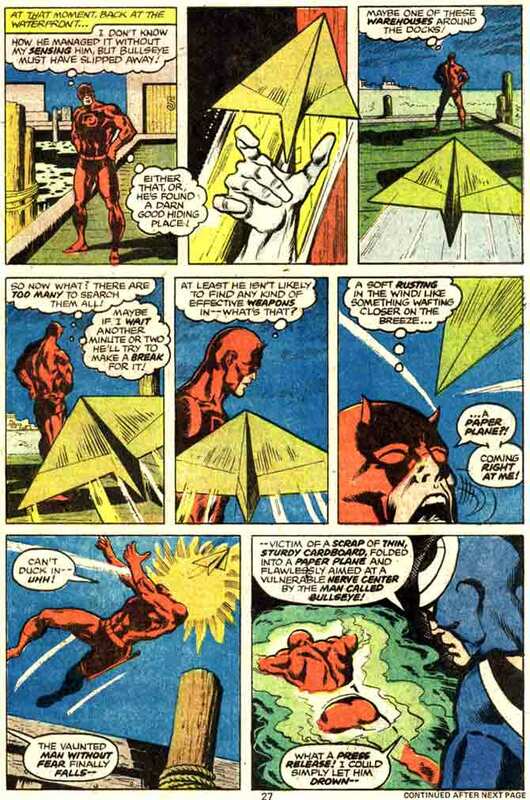 It’s interesting how writers play with Daredevil’s powers to suit their needs. While I’m more inclined to react when I see a situation where they are ridiculously exaggerated (or just used in ways that strike me as illogical), this is surely an example of DD coming across as completely incompetent. It would almost qualify for fellow Daredevil blogger Francesco’s series Preposterous Plot Points. From Daredevil #141, by Marv Wolfman and Jim Shooter, with art by Gil Kane and Bob Brown. Update: Here’s a thought… Wouldn’t he have had the time to move out of the way in the few seconds it took him to yell “A paper plane?! Coming right at me!” Yes, DD, it’s coming right at you. Feel free to duck. Whenever you’re ready. Update 2: When Bullseye aimed for that vulnerable nerve center, did he know Daredevil was going to move his head? Okay, I’ll stop trying to make sense of this scene now. I know it’s futile. wow. i guess thats supposed to impress us with bullseye. im afraid that one will go down as the wimpiest super hero knock out ever. poor matt, im surprised he could ever face himself in the mirror r put on his tights after that one. just goes to show you how dangerous paper airplanes can be. its all fun and games till somebody get knocked out by one. Hey, I really like your blog. I’m a big fan of Daredevil, and your commentary frequently makes me laugh out loud. I think being a blogger must feel thankless at times, so I wanted to be sure to say thank you. Happy 150! Keep it up! P.S. I still that the near miss with the gym mat was worse. Your taking the time to tell me that really means a lot! This blog is my baby, but the hard part is keeping it going when I’m having a particularly busy week like this one (and last). Readers start to drop off pretty quickly when you don’t update, so it’s a matter of setting aside some time to do it. The good news is that I have plenty of things in the pipeline as half-finished posts. I don’t think I’ll run out of DD-related stuff to talk about any time soon. Sure. Incidentally, Once I ate in a restaurant in your city, and the waitress was quite pretty. Cool! Milazzo is a nice place, especially during summer. I have a lot of friends/colleagues who live there or in the Tyrrenian villages in the vicinities. About the waitress, yes, she was incredibly pretty, her hair were a dark shade of red. I don’t remember other particulars, except for the fact that she had serious skills in avoiding even the slightest eye contact.